The properties of a function are defined here. The unique name of the function. It cannot contain special characters or spaces. Defines the HTTP method that will be used to request the function. Defines the entity set on which the function operates. Defines the return value type of the function. This can be either an OData data type (such as "Edm.String", "Edm.Int32", "Edm.Double", etc.) or an Entity Type. Defines whether the return value contains one or multiple data records/values. List of input parameters of a function. A parameter can be added to the parameters list by clicking on "Add parameter", or an existing parameter can be changed by clicking on "Edit parameter". Contains the GUID of the OData service. Contains the function parameters and their values. Context object of the OData Producer. Provides access to the OData service configuration and the processing context. Context object of the OData function. 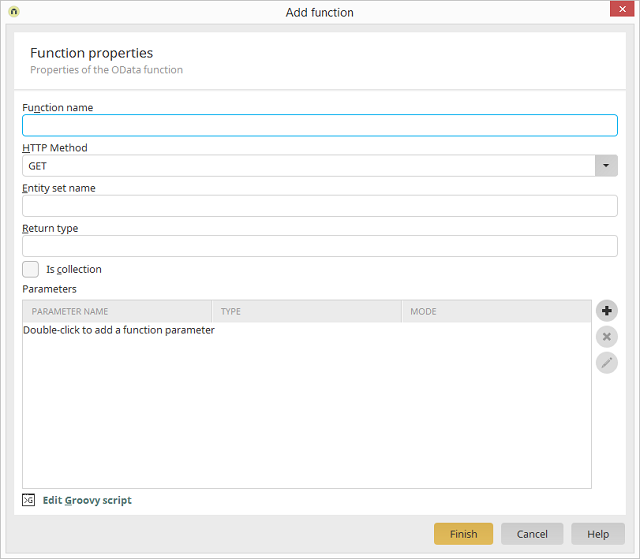 Provides access to the function properties, the input parameters and values, and optional OData query string variables. The Groovy return value of a function must correspond to the data type defined in the function properties. To define a single data record as the return value of the function, the fields of the Entity Type are added to a map, which are then returned. A map is initialized for each data record here. Here, the field names are stored as a key and the values as values. Last, the map objects are stored in a Groovy list object and returned as the result. The OData Provider then converts the data structure corresponding to the data types automatically into the required OData format (JSON/XML).